Maybe it was a grandparent, or a teacher, or a colleague. Someone older, patient and wise, who understood you when you were young and searching, helped you see the world as a more profound place, gave you sound advice to help you make your way through it. For Mitch Albom, that person was Morrie Schwartz, his college professor from nearly twenty years ago. Maybe, like Mitch, you lost track of this mentor as you made your way, and the insights faded, and the world seemed colder. Wouldn't you like to see that person again, ask the bigger questions that still haunt you, receive wisdom for your busy life today the way you once did when you were younger? Mitch Albom had that second chance. He rediscovered Morrie in the last months of the older man's life. Knowing he was dying, Morrie visited with Mitch in his study every Tuesday, just as they used to back in college. Their rekindled relationship turned into one final "class": lessons in how to live. Tuesdays with Morrie is a magical chronicle of their time together, through which Mitch shares Morrie's lasting gift with the world. 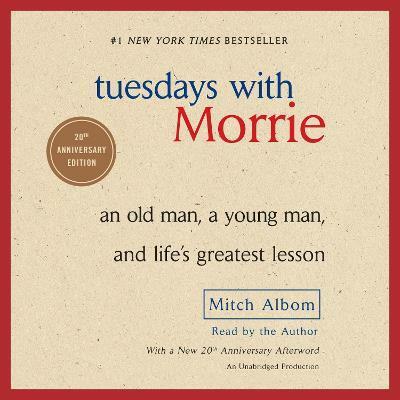 "Tuesdays with Morrie is a magical chronicle of their time together, through which Mitch shares Morrie's lasting gift with the world. "This is a sweet book of a man's love for his mentor. It has a stubborn honesty that nourishes the living." --Robert Bly, author of Iron John "A deeply moving account of courage and wisdom, shared by an inveterate mentor looking into the multitextured face of his own death. There is much to be learned by sitting in on this final class." --Jon Kabat-Zinn, coauthor of Everyday Blessings and Wherever You Go, There You Are "All of the saints and Buddhas have taught us that wisdom and compassion are one. Now along comes Morrie, who makes it perfectly plain. His living and dying show us the way." MITCH ALBOM is an internationally renowned author, journalist, screenwriter, playwright, radio and TV broadcaster and philanthropist. His 13 books have collectively sold more than 35 million copies worldwide and have been published in 49 territories, in 45 languages, and have been made into Emmy Award-winning and critically-acclaimed TV movies. A longtime panelist on ESPN's "The Sports Reporters," Albom has also penned films, plays, and a musical. For more than a decade, he was named top sports columnist in the nation by the Sports Editors of America, the highest honor in his field. In 2006, he founded S.A.Y. Detroit, an umbrella organization that now operates nine charities dedicated to improving lives of the neediest Detroiters. He also runs an orphanage in Port Au Prince, Haiti, the Have Faith Haiti Mission. He lives with his wife, Janine, in Michigan.